Investigators are still sifting through what caused the crashes of Ethiopian Airlines Flight 302 on March 10 and Lion Air Flight 610 last October - however they are focusing on whether a new stall-avoidance software system may have been partly to blame. 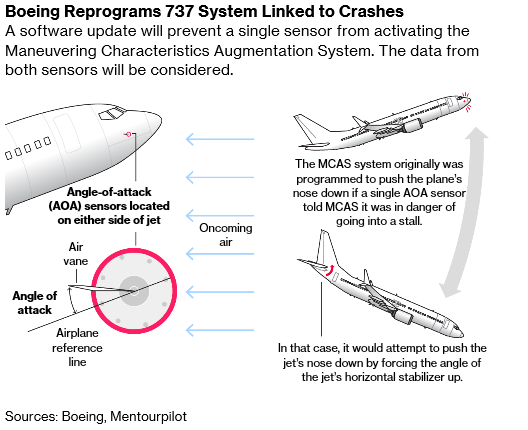 The system, known as MCAS, takes readings from two vanelike "angle of attack" sensors which measure how much the plane's nose is pointing up or down. If MCAS believes that the plane is pointing up at a dangerous angle, it can immediately push the nose of the plane down to try and stop it from stalling. One of them - an angle-of-attack indicator, displays the readings from the sensors which feed the MCAS system. The other, called a "disagree light," will activate if those two sensors are at odds with each other. "They’re critical, and cost almost nothing for the airlines to install," said aviation analyst Bjorn Fehrm - who adds "Boeing charges for them because it can. But they’re vital for safety." 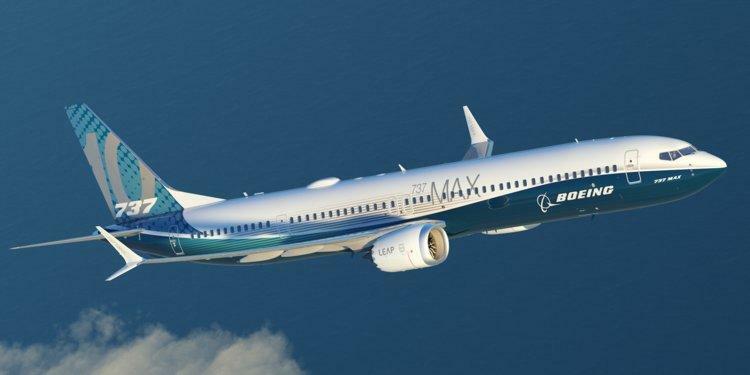 Neither feature has been mandated by the Federal Aviation Administration for the now-grounded 737 Max jets. Of note, Southwest Airlines - which ordered 280 737 Max 8s, purchased the disagree alert option and also installed an angle-of-attack indicator above the pilots' heads. Following the Lion Air crash, the airline said it would place the sensor on the pilots' main computer screens. United Airlines - which has taken delivery of 14 our of the 137 Max 8s it has ordered, did not select the indicators or disagree light. The airline says that pilots use other data to fly the plane. "There are so many things that should not be optional, and many airlines want the cheapest airplane you can get," said aviation lawyer and former engineering test pilot Mark Goodrich. "And Boeing is able to say, ‘Hey, it was available.’"
In response to the crashes, Boeing has committed to making the 737 Max safer. "As part of our standard practice following any accident, we examine our aircraft design and operation, and when appropriate, institute product updates to further improve safety," said CEO Dennis Muilenburg. Another factor which investigators are focusing on is a lack of training on the technically sophisticated Max 8. Reuters reports that the captain of the doomed Ethiopian air crash did not practice on a new simulator before the March 10 crash that killed 157. In both Max 8 crashes, pilots lost control of the plane shortly after take-off, and fought with the planes to stop them from plunging. Disturbingly, "Boeing did not send manuals on MCAS," according to an Ethiopian Airlines pilot who spoke on condition of anonymity. "Actually we know more about the MCAS system from the media than from Boeing." Ethiopian airlines (lawyers') pushed back on Thursday, saying its pilots had completed training recommended by Boeing and approved by the FAA on differences between the previous 737 NG model and the 737 Max version. "We urge all concerned to refrain from making such uninformed, incorrect, irresponsible and misleading statements during the period of the accident investigation," the airline said in a statement. That said, the training itself has now fallen under scrutiny. In the Ethiopian crash, it was not clear if Yared’s colleague - First Officer Ahmednur Mohammed, 25, who also died in the crash - had used the new simulator. As we noted earlier this month, several pilots repeatedly warned federal authorities of safety concerns over the now-grounded Boeing 737 Max 8 for months - with one calling the Max 8s flight manual "inadequate and almost criminally insufficient," adding "The fact that this airplane requires such jury-rigging to fly is a red flag." Meanwhile Indonesian investigators are interviewing an off-duty pilot who saved a 737 Max8 from a nosedive just one day before the same plane crashed. The pilot's intervention the day before the October crash was not mentioned in Indonesia’s National Transportation Safety Committee’s Nov. 28 report on the crash which killed all 189 people aboard.